"Calculating the bandwidth by dividing the amount of data by the flying time of the last pigeon, show that the bandwidth achieved by the pigeons was significantly larger that that available through commercially available ADSL broadband Internet connections: about 2.27 Mbps (Mega bit per second) as compared to 0.75 - 1.5 Mbps. [Please note that all measured times are of an observer on the ground. If measured by the moving pigeon it self, times are a bit shorter, according to Einstein's relativity theory]. Yet the Wi-Fly TCP (Transmission by Pigeons) protocol of wireless internet has had its limitations. First, pigeons cannot fly through Windows. Second, since they don't fly in darkness either, this method's bandwidth drops to zero 50 percent of the time. Finally, there's the problem of droppings download." "The use of snails as data communications agents was not considered before now. As we show in this paper, the negative attitude towards using snails in communications networks is an example of bounded rationality2 impeding bold and creative engineering. Snails are widely assumed to be slow animals. Yet the literature on sluggish speed is surprisingly limited, and few have actually bothered to measure and record it formally. 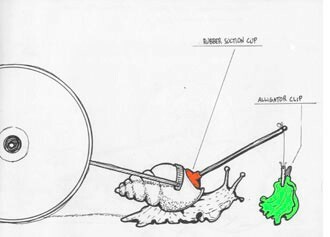 Further, reported gastropod speeds vary widely with species and circumstance, ranging from 0.0000233 to 0.00284 meters per second.
. . . a certain segment of the network's backbone was implemented by shuffling magnetic tapes in a station wagon in the Australian outback. This has prompted Andrew Tanenbaum to note that one should "never underestimate the bandwidth of a station wagon full of tapes."